Madras Woodlands NYC Review - God, We Just Came! 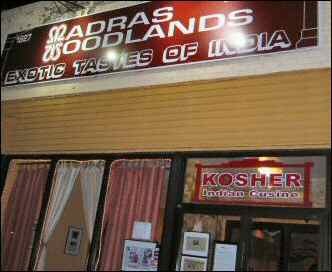 Madras Woodlands NYC Review – God, We Just Came! Oh boy, this is a first for us. A 45-minute orga*m in public. No kidding. God, if we were to die tonight we’d have no regrets (except, maybe for watching Abhishek Bachchan’s movies and premature retirement of this blog). Tired as we are of trashy New York Indian restaurants like Dhaba, Jewel of India, Utsav, Delhi Heights et al, we were maha-thrilled with our meal at Madras Woodlands. For once, we were glad that we are sapad ramans (gluttonous pigs). How else would we have tasted such delicious Idli and Vada, Dosa and Uppuma, Sambar and Rasam, out of the world Lime Pickle and Vanilla Ice Cream on a layer of Badam Halwa. Madras Woodlands was not a recent find. We had driven past the place on Hillsde Avenue in Long Island on several occasions but never had a chance to step in. This time we made it a point to stop by and man were we glad we did. Located on Hillside Avenue, across the street from Maharaja Indian grocery store, Madras Woodlands is a fairly spacious restaurant. As we entered the restaurant on a recent evening, we noticed the place was mostly empty (a reflection, perhaps, of the recession). A short, fair desi girl offered us the choice of a booth or regular seating. A little later, a caribbean lady with dyed hair came over and took our order. We started off with a glass of cold Madras Mooru (buttermilk with spices added). Madras Mooru ($1.95) had a fine flavor of curry leaves, cilantro and hing and whetted our appetite. The food arrived as we were nearing the end of our Mooru. Boy, the angels inside Madras Woodlands’ kitchen made the Masala Dosa sing with flavor. So good that it required no accompaniment. Large, crisp and insanely tasty, it was very heaven with the accompanying Onion Chutney but the Coconut Chutney and the Potato Filling inside could have been a bit spicier. Our Uppuma, Vada and Idli and the Onion/Drumstick Sambar were worthy followers to the peerless Masala Dosa. The crisp Vada, featherlight Idli and flavorful Uppuma with cilantro and green chillies were beyond reproach. The Chapati came wrapped in a soft paper. Sweet. The Rasam swept us away into paroxysms of trembling. Sour and pungent with pepper, this Rasam is the stuff that wars should be fought over. As for the cashew-filled Pongal with the Onion Chutney, we must have done a lot of good deeds in our previous birth to savor such divine stuff. Sure, we tried several curries. Where do we even start? Channa Sag was subtly spiced and tasty like hell. The Cabbage Curry with a sprinkling of cashews was again a flavorful delight as was the Carrot Beans Poriyal. Whether you prefer the curries as an accompaniment with Sambar+rice or Yoghurt Rice or with the Chapati, they give no room for complaint. If you thought these Madras Woodland blokes are good merely with the entrees, you’d be so wrong, so wrong. We tried Badam Halwa with Vanilla Ice Cream on top, Gajar Halwa and Gulab Jamun. We lingered over the Badam Halwa and scraped it until all that was left was the shiny stainless-steel cup. Perhaps, our expectations were in the stratosphere by now. But our Madras Coffee ($1.95) was a let-down, low on decoction and high on milk. Fix the coffee, schmucks. Service was prompt and polite. Folks, all in all our meal at Madras Woodlands was a fine symphony with few stray notes. The good lord smite us down if we don’t sell our home and move to New Hyde Park soon. Alas, since a home these days in foreclosure America has few takers, we’ll have to be content with visiting Madras Woodlands once in a while. 9 Responses to "Madras Woodlands NYC Review – God, We Just Came!" Nice clip. Seen the movie. Lovely! BTW, the latest issue of New Yorker has a flattering piece on Nora Ephron, writer of When Harry Met Sally. Had lots of yummy food, I guess!!!! Given the way our country (U.S.) is going these days you don’t have to be an achiever to land here…just being a schmuck will do fine. I saw their website http://www.madraswoodlands.com/home.html and it is quite tempting too… I would visit this place for sure on my next trip to NYC…. We’ll try and put the full review up soon. By the way, hope this is not a branch of the Woodlands hotel at Radhakrishnan salai!! I have dined at Woodlands only a few times, loved the dosas and the idlis. Hope they maintain their standards at every branch!!! Nothing in the About Us of Madras Woodlads to suggest a connection to the Chennai Woodlands. Thus spake raghu-dhusta oops raghu-thustra? sir, can u translate ? am not into english these days. You write: sir, can u translate ? Madam, please buy a dicktionary (sic). Thought I signed for the translation also. Anyway, gr8 to know u a woman, God bless u chick. In Victoria’s Secret we trust. God is for the chick-lets. After a full-plate of Vegetable Pulav with some spicy vegetable curry (moong-bean curry) we’re feeling drowsy. u cook or ur boyfriend ?